The production teams at WRG, the premier sanctioning body for dirt track racing in North America, are no longer fully dependent on the local cellular towers in remote locations at peak times during an event. Thanks to Dejero Cellsat, that intelligently blends cellular connectivity from multiple mobile network providers with Ku-band IP satellite connectivity from IntelSat, WRG's production team is now achieving its goal of streaming 100% of its premier racing schedule, saving on resources, cost, and set-up times in the process. They now have the bandwidth needed to transmit broadcast-quality video in real-time from virtually anywhere. CellSat blends the individual strengths of cellular and satellite networks that has enabled a sharp rise of its social media profile, while it has seen exponential growth in live fan engagement during races. Its live streaming has transformed as a result. Before such time, the dirt track racing specialist was losing valuable viewer interest because event coverage from remote, congested locations and challenging venues just wasn’t feasible and the group was forced to leave many events out of their streaming schedule. They needed a connectivity boost. CellSat already made its mark in Europe last year, during a soft launch with the Canadian crews from Global TV. Global needed to capture the high-profile Royal Wedding of Prince Harry and Meghan Markle, while surrounded by nearly a hundred thousand visitors, busy live streaming and posting photos back to their friends and families around the world, congesting cellular networks. 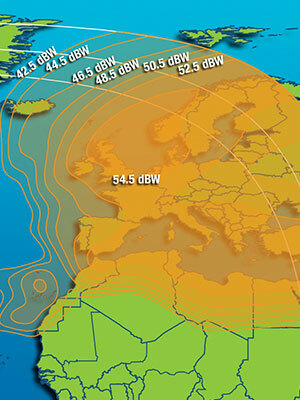 This type of event is the key market for CellSat in Europe: “The beauty for us of using Dejero CellSat is that it offers the ability to blend multiple connections and get increased reliability at a big event like the Royal wedding. It’s great that we can use our existing video over IP workflow,” explained Mark Blanchard, manager, network services, Global Television Canada. The CellSat connectivity service was created in partnership with Intelsat, a world leader in providing integrated satellite communications, who just launched a European satellite hub to support CellSat on European soil. The IS-35e Ku capacity satelite sits at 325.5ºE and its beams reach from Iceland to Saudi Arabia and from West Africa to Russia. Since the service is provided through a single point of contact, Dejero; procurement, management, and billing are greatly simplified. The solution includes hardware, software, and connectivity services to the CellSat network—all managed in the cloud, and backed with industry-leading technical support. Microwave technology is also reliable, but a story or event can occur beyond its range, or in a challenging location where line of sight or inclement weather obstructs the signal. In addition, while a satellite connection need not worry about location on the European continent, being close to a border could mean cellular connection to a foreign cell tower and higher prices. CellSat allows users to turn cellular roaming off to avoid these issues. A midstream activation feature simplifies switching between cellular-only and CellSat transmission paths, without having to stop and restart the transmission. CellSat midstream activation puts greater cost control in the hands of broadcasters when contributing high-quality video content from the field. In addition to video transport up to 20 Mb/s with Dejero HEVC-capable encoders, the CellSat blended connectivity service also enables data transport for applications such as email and Internet access.